Since first opening their doors in 2011, Bovada has worked hard to be the number one online sportsbook for US players. They have their license to operate from Kahnawake, which is a very reputable jurisdiction that gives players plenty to feel peace of mind about. In the time they have been active, they have built up an excellent reputation among players for their quick and reliable cash outs on top of their great mobile interface that makes placing sports bets really easy from anywhere you have a connection. We consider this brand to be secure, legitimate and reliable and never hesitate to include them in our reviews of mobile betting apps. Mobile sportsbook players at Bovada can get a pretty good deal on their first deposit. The way this works is that you’ll get 50 percent added on for your initial deposit, and this is worth up to a maximum of $250. You’ll need to roll over the sum of the bonus and the deposit a total of 5x before you can cash out. For example, if you deposit $100, you’ll get a bonus of $50, and you’ll need to wager through $150 * 5 for a total of $750 before you’ll be able to request a cash out after claiming this bonus. It’s a pretty good deal that gives players a substantial boost to their starting account balance here. They run other promotions on a regular basis, but they depend on the events going on and the seasons that sports are happening in. For example, you might get special rebate offers or special rates on certain parlays. Other times, you’ll be able to get free chips or risk-free bets on special events. It really just depends on what’s going on at the time because sports betting is such a season-based thing, but they normally have multiple good deals each month that you can take advantage of via mobile. 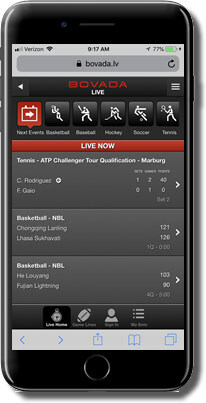 The Bovada Mobile Sportsbook software interface is set up around a web-based app. The idea is that you’ll use your mobile web browser to go to their website, and it will automatically let you log into the mobile sportsbook app through that same window. This allows all kinds of different mobile devices like smartphones and tablets to log in without needing some special download. It also puts you in a position where it’s extremely flexible in terms of the different operating systems that can access it, so if you have iOS, Android, Blackberry, Windows Mobile or just about any other mobile OS, you’ll have no problem logging in and putting up wagers. To get started playing, all you’ll really need to do is navigate to their website and create an account. There’s nothing special to download to your mobile device. All you need to do is go to their website once you have an account, log in using the prompts that come up, and the interface itself will be available directly on your screen. You can place bets, make deposits, request withdrawals and manage every aspect of your account straight from this interface. Bovada covers every major sport out there, and they break up their selection of markets in the following way. At the highest level, they have the most popular sports and contests that people like to wager on by volume, and the less popular options are made available further down the screen. Once you choose a sport, you’ll be taken to a selection of the given leagues and events for that sport, and you can choose the ones that you want to look at. From there, the next level down will list out the games, matches and events for that league that are available for betting, and you can search through to find the exact teams, dates, games and match-ups that you want to look at. Baseball, football, soccer, tennis, basketball, MMA, golf, cricket, boxing, elections, horse racing, rugby and plenty of other sports and events are available for wagering here. The most popular and fastest-growing segment of the mobile sports betting world is live betting. What this allows you to do is wager on things that are happening during a game or match so that you get more engagement out of watching and checking out what’s going on. You can place wagers on things like which team will score next or which team will commit the next foul. There are a ton of options for live betting that are tailored to fit the different sporting events that are out there, and it’s easily the most intense and action-packed way to wager on sports today. To get started with live betting, you’ll just need to log into the Bovada Mobile Sportsbook app using your web browser and choose the live betting section from the list of sporting events. From there, the different games and contests that have live betting markets available will be listed out for you, and you can easily choose the game you’re watching right then. The list of available live bets for that game will come up immediately, and all you have to do is place your bet and watch to see if you come out as a big winner. Support is designed to be really easy from a mobile device. You can use a simple telephone call, which can be initiated from the web client, or you can send them an email. To help prevent you from having to keep up with a support email address and copy/pasting over to your email app and all of that, they offer a really easy web form that operates inside of the app itself to send off an email. You can expect a reply within a couple of hours at the most, and because their customer support team is available 24/7/365, they always give you fast and helpful replies. In terms of the cashier section, there are a few key ways to make deposits and withdrawals. Credit cards, bitcoin and bank transfers are the most popular, though they also support certain money transfer services depending on where you’re playing from. They have a solid reputation for fast payouts, and they’re super reliable with paying out when they are supposed to. You can request both deposits and withdrawals straight from the mobile app as well. The Bovada Mobile Sportsbook app is designed to be very flexible and to work for a really wide range of individuals with different devices. However, it’s also designed to allow you to manage every aspect of your account and of your experience without having to bounce back and forth between the computer and your mobile device. They’ve done a great job with their software, and they have plenty of betting options, including live betting. They also have a top-tier reputation in the industry, and that gives people who play with them a tremendous amount of pace of mind in knowing that they will be taken care of.